← Peace on earth, goodwill towards all: wouldn’t that be nice! A new year is upon us; January 1, 2019 is just a few days away. My, how time flies. As far as I know, I’m the only one in my family who makes New Year’s resolutions, although I should ask my daughters-in-law and my granddaughter. I can imagine that at least one of them might be part of the club and I just don’t know it. As someone who lives by lists, including daily to-do lists of things that I know I’m going to do but love being able to tick off at the end of the day, I love reviewing my New Year’s resolutions at the end of a year and spending time identifying a few major goals for the year ahead. The end-of-year calm descends briefly with the waning of the frenzy of holiday prep and festivities. Even the news shifts from fast-breaking news to various versions of “the year in review” (well, with a few unpleasant exceptions). This period of calm lends itself to personal reviews of the year just ending, along with personal hopes for the year ahead. Since the year hasn’t quite started yet, we can look upon it as a blank slate, full of promise. We can at least pretend for a few days. How did I do with last year’s resolutions? As I announced in my New Year’s post last Dec 31 (A New Year’s tradition: reflections, resolutions, and dreams of fresh starts), I set 4 major goals for myself. I didn’t do so well! Running. Run 500 miles in 2018. Hmm. Well, I was sick all of January and most of December, so I’m not going to count that time. I took a tumble during a 10K at the end of September and was nervous about running after that, so I’m going to discount Oct and Nov, too. That still leaves Feb-Sept. If I was aiming for more or less 10 miles per week during that time period, how did I do? Not great, even after giving myself a pass on 4 months. Being the list maker that I am, I did keep track. It was more like an average of 6 miles (10K) per week than 10 miles. I did at least complete 3 10Ks. I’m generously giving myself a B-. What the heck! Writing. I committed to writing a new series of stories for small children. I did start it, more than once. I got bogged down because my premise includes a few characters who are children of immigrant families. I wanted to add that dimension of kids with different languages and cultures at home than the ones they learn and live by in school and play. Then the whole issue of cultural appropriation became public in an ugly sort of way while I was working through this, and it made me nervous about continuing. As a “white person”, is it OK for me to be writing about anything but what I have personally experienced? And, if not, how does children’s literature become more diverse, to better reflect our diverse society? I’m not sure I’ve resolved this yet, but I still like my initial idea. I think I have to have the confidence to work through it and let the chips fall where they may. 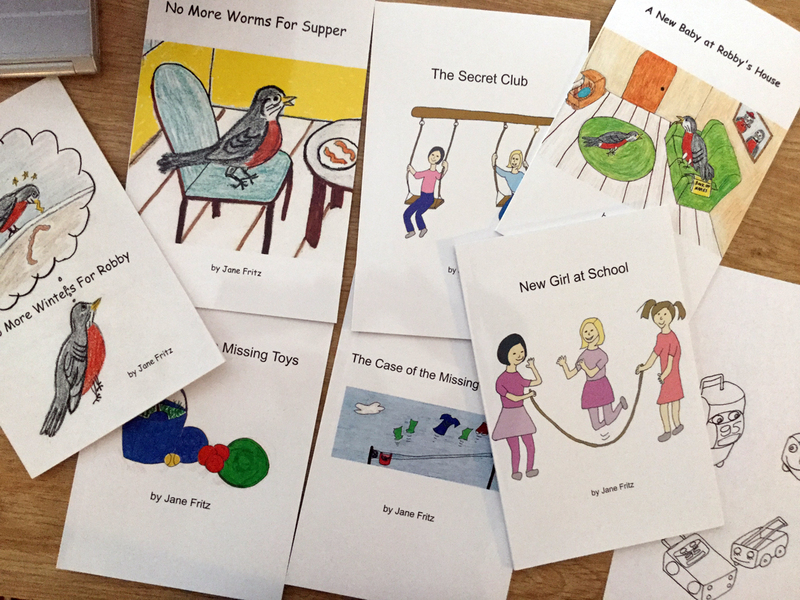 I did write and illustrate a few stories for my youngest grandsons, but that’s not the series I had planned, not by a long shot. I’m giving myself a C.
Blogging. I committed to writing a blog post more or less once a week. I am happy to say that I succeeded in that one; I even exceeded it. Gosh, I hope I didn’t post too many times and have people saying, “oh, no, not again!” I’m giving myself an A (for quantity, not quality). News. I committed to not obsessing over the news. I was an abject failure at this. I’m not going to even try to address this despair-inducing problem in a resolution this year; I know it would be futile. I’m giving myself an F.
What major goals will I set for myself for 2019? Running. Instead of distance, I’m going to set some target races for myself. That’s what gets me onto the trails. To do: Feb 10, 4K Frozen Nose and Toes Fun Run. End of May, Fredericton (or somewhere else) 10K. Mid-Sept, Terry Fox Run. 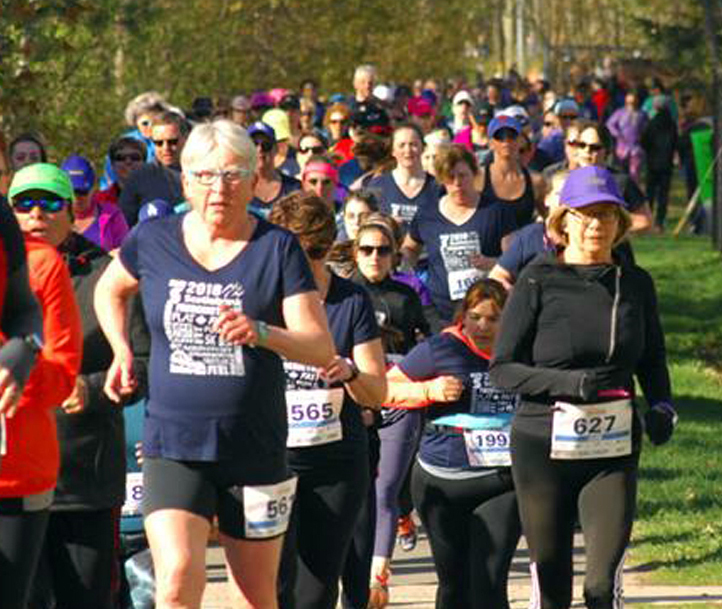 End of September, Fredericton Fall Classic 10K (or somewhere else, and no tripping this time). Writing. I will continue with, and complete, my idea for a new series of children’s stories. These old series need company! Blogging. I will write the equivalent of one blog post per week (again). Creative endeavours. 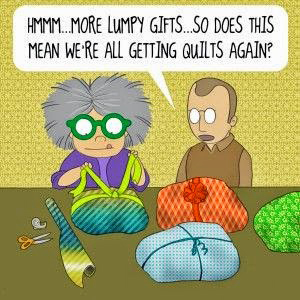 2018 was a year with no quilting whatsoever. I miss every aspect of it, from initial design and choosing the perfect fabrics to tying off the last hem stitch. I will undertake some quilting projects, and perhaps try watercolors again. If you are not a list maker or a committed creator of New Year’s resolutions, you may feel free to shake your head – gently, of course, and with good humour. If setting out New Year’s resolutions is an integral part of this time of year for you, welcome to my world. 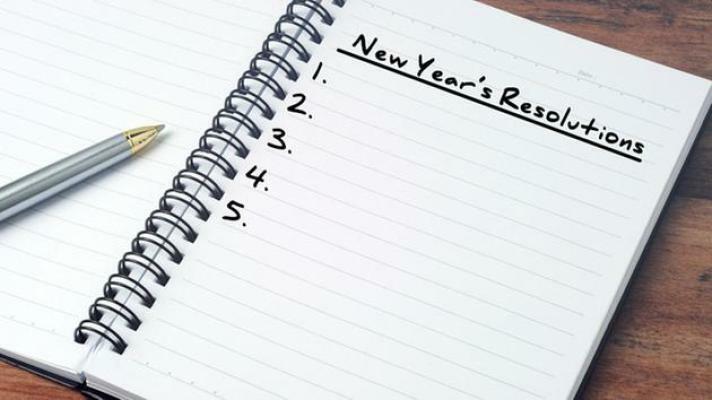 How did you do with last year’s resolutions? Are you shifting to an entirely new set of resolutions this year, or is there some perseverance evident in your resolutions for 2019? It’s all good. It’s a blank slate, after all! Happy New Year, everyone. This entry was posted in Children's stories, Life stories and tagged 2019, blogging, Creativity, family, friendship, happiness, inspiration, motivation, New Year's resolutions, news, perseverance, quilting, relationships, running, writing, Writing for children. Bookmark the permalink. Good grief, 1150 miles. Roy, that’s the mother of all targets! Bonne chance, my friend. Happy 2019! Good for you to review your list from last year. I doubt a lot of people do that. I do not make New Year’s resolutions per se but I do from time to time thru the year decide I need to change some things and then pursue it. I might try to write some goals with steps to achieve them this year. I see that a lot on social media right now. Best of luck with your children’s books. I think you can write characters from different cultures. Imagine the books that would not exist today of that was the case! Thanks as well for your encouragement about my kids’ story idea. You’re right, I need to just go for it. Happy New Year. I look forward to reading more about just how much you continue to enjoy retirement! A thought-provoking post, dear Jane. In my book, you’ve done very well indeed. I see that you tried at everything you planned. You succeeded with the blogging. You also did very well at running — maybe your goal was unrealistic in the first place? Great marks for the achievement, despite the setbacks. Be KIND to yourself on this front. Your efforts with the children’s series: brava for the intention AND for starting.We know that if authors only stuck with what they know, life would be dull; we must imagine and empathize to create great stories. Ideas for dealing with this controversial topic of cultural appropriation? 1) Seek out knowledge on what the real issues are; not knowing is often the basis of division, roadblocks and unnecessary heartache. 2) Consider collaborating with someone from a different cultural background to write the books. 3) Write the book, then get feedback from a cultural adviser/ professional editor with relevant experience. Cynthia, thank you for your glass-half-full analysis of the degree of success of my 2018 resolutions. I’ll take it! I really appreciate your suggestions wrt my children’s story idea. Good advice. You might even be one of the people I seek out for feedback – when I get that far! May all your hopes and aspirations for 2019 come to pass, Cynthia. As long as you can use your plumbing and windows before you own them! 😏 I hope you have some non-financial personal goals as well. Happy New Year! I have never been a NY resolution maker but this certainly gets me thinking a little more in that direction. Thanks. Any time, Wayne. You might need a resolution that says “See more of Emmett this year”! 😏 Happy New Year to you and Jill.